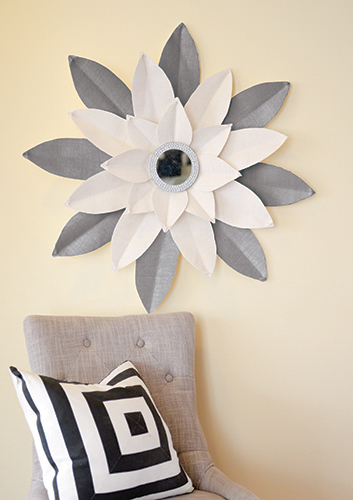 The neutral shades of burlap, together with the fresh feel of a mirror in the center, will add new life to your décor. Trace and cut eight of each shape from the template . There will be a total of 24 pieces when complete. Beginning with the first piece, put a dot of hot glue at the outside tip and pinch the ends together. Continue until all pieces have the pinched end look. Cut a large circle base from the cardboard piece. Adhere the large petals to the circle base. Adhere the medium petals on top of the large petals. Adhere the small petals on topof the medium petals. Adhere a decorative mirror to the center. Attach a ribbon loop or a picture hanger to the back of the circle base and display where desired. Use a clothespin in step 2 to hold the different pieces together as the glue holds—helps avoid getting glue on fingers. A chipboard piece can be used in place of the corrugate square. Change up the burlap colors around the mirror if needed so that the end display will fit the overall décor.